To her family and to her friends, Ruth Patterson Hart was known for her lifelong advocacy of the arts. Making art was simply an essential part of her being, expressed through her extraordinary gifts as a gardener, her skill with her hands, and her easy friendships with curators such as Rachael Griffin, artists like William Givler, Louis Bunce, and Jack McLarty and noted architects Pietro Belluschi and John Yeon. She helped found Young Audiences in Portland and she was an active member of the Contemporary Crafts Gallery. She was bright, witty, articulate and well-traveled: the product of a liberal and sophisticated education. But few people have seen Hart's own paintings, drawings and mural studies. Few people know that from 1928 until 1939, Ruth Patterson prepared herself for a career as an artist and was at the heart of Portland's vibrant art scene. As a young woman, right out of high school, she studied at the Art Students League in New York with Boardman Robinson, a noted illustrator, political cartoonist and associate of John Reed. She spent a year in Florence learning etching. She went to Mills College to work with printmaker Roi Partridge, and with such famed European modernist artists as Hans Hoffman, Alexander Archipenko and Laszlo Moholy-Nagy. In the 1930s, Patterson spent a good deal of time with her relatives in Hawaii and her art flourished there: she had a one-person show at the Honolulu Art Academy, and one of her landscape paintings won the purchase prize at the Academy's annual exhibition. Once back in Portland, she and a group of friends started the Creative Art Gallery; after it closed, the Portland Art Museum mounted an exhibition of their work. 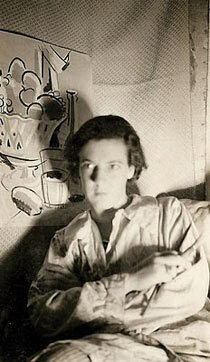 In 1939, she received her MFA from Colorado College. Back in Portland, she worked in graphic design. She took weaving workshops. She taught at the Museum Art School and at Riverdale School in Portland until 1944, the year that she married attorney Allan Hart. With three children, a busy husband and family affairs to attend to, Hart, like so many women of her generation, found little time for her own pursuits. Thus, the drawings, watercolors, sculpture and paintings reproduced on these pages are among those she stored away: testament to a talent underestimated until now. Together, they trace Hart's journey from student to professional artist and reveal her keen gifts of observation. While she was not drawn to abstraction, the influence of such formalists as Hoffman and Moholy-Nagy is behind the lucidity and logic of her compositions. The works suggest not only Hart's broad range of interests, but also her discipline and dedication. She drew constantly, on whatever materials were at hand. Of particular interest are her "spit" and ink drawings: wonderful quick figure studies often rendered on thin onion-skin letter paper. Her increasingly fluid technique, in which line swells and contracts, suggesting volumetric form and mass, shows her growing assurance and her understanding of the figure. This fluidity carries over into her watercolors, where, with a few lines and washes, she suggests the mountains and farmlands of Hawaii, with its palpable atmosphere and myriad shades of greens and browns. While it is fascinating to conjecture what Hart's work might have been like had she continued her career as a painter, it is equally clear that she simply put aside one form of making art for another. She translated her skill in rendering textures, colors, line and pattern into plant materials. She maintained and nurtured her love of aesthetics through lifelong friendships. She found fulfillment and satisfaction in her family and in travel. Thus, she was a lifelong practicing artist. It is a pleasure to see again this aspect of her career's work.